Quick Bovada Sportsbook Review: Americans’ best bet for a fun NHL sportsbook! Bovada offers tons of hockey props to get you excited about tonight’s games. Visiting Bovada sportsbook is like making a trip to Las Vegas. The rush and excitement you get from sports betting just seems to jump out from your computer screen or mobile device whenever you land on www.bovada.lv! 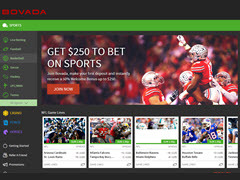 Bovada is the U.S. version of Bodog, a sportsbook that was founded by Canadian Calvin Ayre. (That might explain why NHL hockey betting is such a big part of Bovada sportsbook.) Bovada came into the American market in 2011 when Bodog decided to expand its branding. Both sportsbooks are certified in North America by the Kahnawake Gaming Commission in Canada, and Bovada shares Bodog’s stellar history of payouts, customer support and fair gambling policies. Of all the NHL sportsbooks we use, Bovada has to be the most fun one. They feature the standard moneyline, puck line and over/under NHL betting options, but the best thing about Bovada hockey betting has to be all the props. 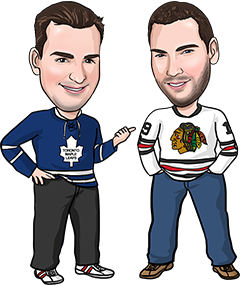 You can bet on whether Stamkos will score tonight or not, whether Crosby will get more points than Toews, over/under how many saves Price will make tonight and more. Did you know? Bovada will cover your fees for your first withdrawal of each calendar month. You can bet on Russian, international, AHL hockey and more at Bovada. Let’s see what other reasons there are to bet hockey with them in this Bovada Sportsbook review. Bovada has a great welcome bonus for Americans, giving you an additional 50% cash bonus on your first deposit up to $250. Deposit $500 when you join Bovada and all of a sudden you’ll have $750 to bet with. Getting bonuses like that are a great way to build your bankroll when you are just getting started in online hockey betting, so even if you don’t think you’ll bet a lot at Bovada, it’s still worth joining to take advantage of the free cash! The Bovada sportsbook bonus requires you to rollover (bet the equivalent of) your deposit plus bonus 5 times before you can pull out your money. Sportsbooks offer you a bonus to get your business, so it’s only fair to give them that amount of business before you withdraw. There are tons of other Bovada bonus offers as well, like the casino welcome bonus and the 100% poker welcome bonus. Bovada customer service will give you all the help you need. You can either send them a message online or you can phone them 24/7, 365 days a year. They accept deposits via credit card or Rapid Transfer. You can also use a Visa Gift Card to make your deposit, and if you’re having any trouble making a deposit, you can call them anytime for assistance. Mobile betting is one area where we have to be critical in this Bovada sportsbook review. They recently redid their website and we don’t like how it affected the Bovada mobile betting. With all the things going on with the Bovada website, it can take a long time to load on your mobile device. If you’re willing to wait a few extra seconds to find the game you want to bet on, mobile betting at Bovada is easy from there. Click on the bet you want to make, enter how much you want to risk or win on the Bet Slip, and you’re done. There are a few reasons that Bovada might not be the best fit for you. Bovada is not the quickest online sportsbook to post their NHL betting lines. If you like betting games early in the day, you’d be better off playing somewhere else. If you don’t meet your rollover requirement within 6 months of receiving a bonus, the remainder of the bonus will be forfeited. If you’re American and you like hockey betting, you simply have to play at Bovada. They are the best NHL sportsbook option for U.S. residents.